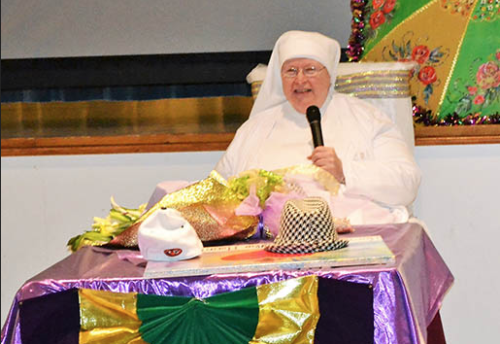 The 46th Annual Little Sisters of the Poor Lawn Party has come and gone. As usual, it was a great success. One of our challenges this year was the weather forecast. Each year, the Little Sisters pray to St. Joseph asking for good weather. With forecasts of 80-85% chance of rain during our 10 a.m. – 4 p.m. event schedule, there were plenty of doubters. In fact, the Band Director from McGill-Toolen Catholic High School called on the morning of the event to ask about our contingency plans. (They have 110 members with a huge variety of instruments). I told him that there weren’t any contingency plans, the Sisters had assured me that their prayers would work. 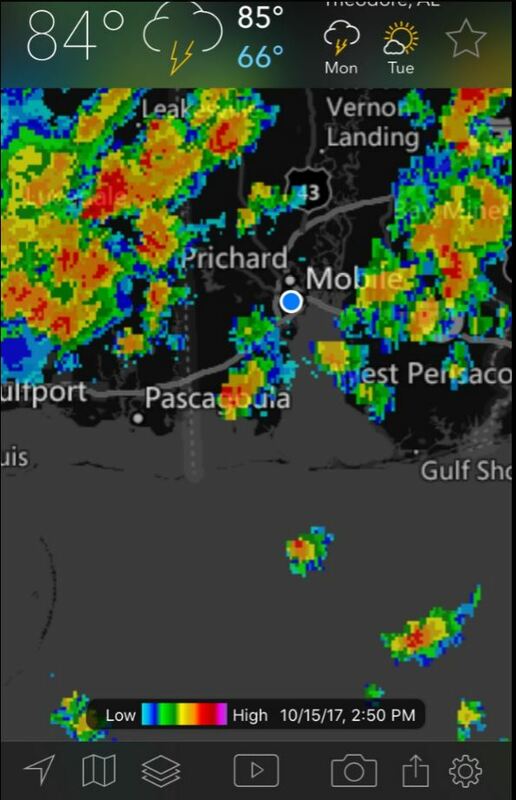 I’ve included a screen shot of the weather radar which I took at 2:50 p.m. that afternoon. See the blue dot in the middle…that’s us! Exactly 15 minutes after closing time, the sky let loose a torrent! Another St. Joseph miracle! Even though our crowds were somewhat smaller, the fun and frivolity were at a peak. For the second year in a row, we engaged the wonderful family band, Pelican212, as our entertainment. McGill-Toolen’s band played for us, continuing their long tradition. We had raffles, delicious food, wonderful games, pony rides and petting zoo, white elephant sales, and so much more! Our Residents and the Little Sisters welcomed families and friends from near and far. We had the help of more than 600 volunteers, without which we would not have the success we enjoyed. God truly smiled on us…again! We are already planning the 47th Annual edition. Hope to see you here! Copyright © 2018, LSOP Mobile. All Rights Reserved.